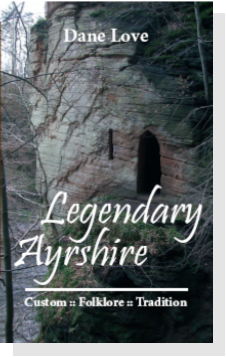 Legendary Ayrshire is available direct from the author's online Bookshop. Many of Ayrshire’s traditional tales are being forgotten in an ever-modernising world. This books takes a look back at the folklore and customs of the county, rediscovering the places and stories that were honoured in some way by the Ayrshire folk of the past. Here can be found accounts of the places traditionally associated with early saints, and thus venerated for centuries, as well as rocks and stones that were perhaps places of pilgrimage. Ancient wells and strange caves can be found all over the county, and this volume is a comprehensive guide to them all. There are traditional tales of ghosts and hauntings, fairies and witches, as well as the ancient festival of Beltane, still long revered even after Reformation ministers deemed it as un-Christian. Some of the old traditions associated with birth, marriages and death, often unique to this county, are recalled, as well as other customs that took place at different times of the year.